Hardy, disease resistant nut trees from Mark Shepard - on sale until Jan 9, 2017. Okay okay, so I did one of those gimmicky things. I decided to extend the sale for one more week, until January 9, 2017. At that point, the sale really is over. There are two reasons I extended the sale. One is that over the Christmas Holidays was kind of a crazy time to offer a sale, and the other is that I know that some people might need more time to think about whether they'll plant a bunch of trees this spring - maybe it's a new year's resolution for some people. Spend $1000 in the store, and get $120 off. Enter the coupon code: gonutz at checkout to get the discount. It’s intended mostly for the bulk nut trees, but you can mix and match with any of our stock if you want to take advantage of the sale. I hope you've been enjoying the information I'm sending along in these newsletters - please feel free to respond to these emails with questions, and I can address them in future mail-outs. This time out I take a different approach - 5 Reasons Not to Buy Nut Trees. Since the sale is going into overtime, I thought I’d do something unconventional, and give you five great reasons not to plant nut trees this spring. Not exactly what you’d expect from someone who sells nut trees as part of his livelihood, is it? I’ve heard the objections before - sometimes from a spouse, or a neighbour, or even from own inner voice. “I live on a small property that’s filled with mature trees that leave swathes of shade thicker than a muppet’s eyebrows." Hazelnuts are pretty compact shrub, especially if you keep them pruned, and they work well as a small hedge. Their overall profile is about 8’ wide at maturity, and while I’ve seen them get as high as 20’ or more, that’s usually a sign that you’re not pruning them for good nut production. AND as for the black walnuts that shoot lasers at other plants: hazels are pretty much safe from juglone, the chemical that black walnuts exude. With chestnuts, research seems to be inconclusive about how much juglone affects them. Plant them as far from black walnuts as you can and hope for the best. If it’s lawn - chestnuts make a nice shade tree, and hazelnuts can be snuck into foundation beds, or make great hedges. Crops/Hay - Read Restoration Agriculture. Start stacking functions on your crop land to get multiple yields from perennials. Just saying. If you want or need to keep your fields intact, both hazels and chestnuts make great hedgerow/windbreak trees - and nut pines make even better ones. I’m planning a mixed windbreak with two rows - one of hybrid poplars (fast), and one of nut pines (slower growing, but much longer lived). Objection #3: I love nuts and trees (and nut trees) but I don’t have time to plant trees this year. Maybe next year. You may be using very clear thinking. Be realistic about the labour you have available to you. Don't bite off more than you can chew in a season. Have a back-up plan. BUT don’t use this as an excuse - there are always work bees, kids, parents, grandparents, aunties, uncles, friends, neighbours, school classes etc etc - why not plan an event for the community to come plant your trees? Your helpers get to learn about perennial crops, get fresh air and the enjoyment of working with their hands, and you get free labour. Make sure to give very clear instructions, and be well-organized beforehand. If event planning is not your thing - do keep your labour requirements in mind. In a future newsletter I’ll let you know what to do if you end up with more trees than you can plant (it’s happened to me). Objection #4: Isn’t that a lot of money to spend when I can just buy nuts from ‘the Walmart’? It should go without saying that the quality of stock from Walmart and other big box stores is highly variable. When I first started buying fruit trees, before this nursery was even a thought in my head, I bought a pear tree at a commercial nursery, in a big old 20 gallon pot. As I’d read, I agitated the roots, and tore them up a bit, dug the hole extra big. The tree didn’t do much the first few years. As in - it didn’t grow at all. It got leaves and even flowered in the spring, but that was it. I tried a severe pruning to stimulate growth. After 7 years, that pear tree is smaller than when I first bought it, and shows no sign of growing any more. It's a columnar pear that wasn't supposed to be columnar. The pears also were smaller than average, and of course, only micro harvests. An Asian Pear right beside it, planted later, and much smaller, from a nursery I trust (Whiffletree - check them out.) It was giving huge crops while the other one just sat there. Objection #5: Won’t all this nut growing be a lot of work? Some of us have day jobs, you know. See number 3 above. Gauge your time wisely. In my experience, growing anything takes adjustment. You need to set aside time to plant. You might have to water if there’s a drought in the first season. You have to work harvesting into your late summer or autumn schedule. You might have to learn how to use nuts, or buy a good cracker. But speaking for myself - I LOVE all that stuff. Time out on the land getting my hands dirty - yes please! Wandering an autumn field picking nuts - oh yeah! Cracking nuts - Fun fun fun. Feasting on and sharing the nuts you grew yourself - priceless. Bonus Objection: What about pH, water, soil, steep slopes, angry cassowaries/sloths/grizzly bears/deer? pH: Hazelnuts like a pH of 6-7, Chestnuts around 6.5. Nut pines - variable, but a bit on the acidic side. Will your soil be too alkaline or acidic? I don’t know. If you’ve got soils that are pH of 4, or 8 - you probably have bigger problems then whether these nut trees will work. If you have more common 6-7 pHs, you’ll probably be fine. My own personal opinion at the moment from reading, and watching videos is that pH is probably of less importance than the amount of humus/organic matter in the soil. I’ve heard Geoff Lawton say so many times how adding compost, and getting the soils full of organic matter (like from tree leaves, for instance) moderates all the effects you’d expect from pHs that at first seem inappropriate. Water: I’ve seen healthy hazels on a flood plain, and they do great in well-drained soils. Sandy, clay, doesn’t seem to matter. You probably know your own soil’s capabilities better than I possibly could - if you’ve had problems in the past - be careful. Don’t order as many. Try a few. Soil: Clay, Loam, Sand. Which do you have? Gravel? Hmm. When I first heard Mark Shepard’s responses to questions about soil type, I was surprised. But then, I shouldn’t have been. Since we’re dealing with trees here, instead of getting caught up about which type of soil, let’s look at what’s growing on similar soils just outside our doors. Chestnuts: If you have oaks, beech, or (American) chestnuts in your bush, and that bush has similar soil to what you’re planting in - go for it. Try them out. 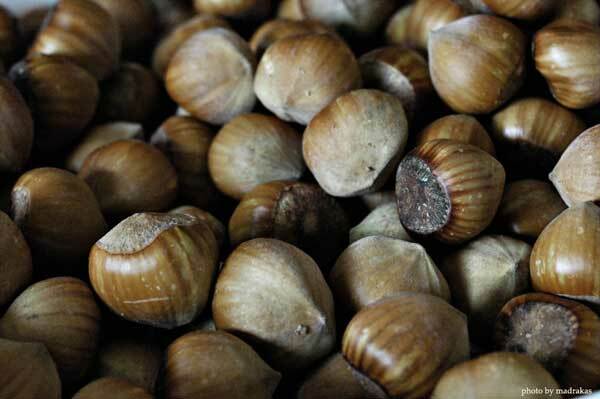 Hazelnuts: They’re in the birch family. So if you notice birch or hickories growing in similar soil, you’re probably set. Nut Pines: Got any conifers? Pines? Spruces? I’ve found all these trees to be very well dispersed over a wide variety of soil-types. If you have them growing successfully on your land, give nut pines a try. Even if you don’t observe relatives of these trees in the soils you’re considering planting in, try with just a couple of trees. Top dress with some compost/organic matter. Trees change the ecosystem around them over time - so even if they get a slow start because the soil isn’t absolutely ideal, if other conditions, like nutrients, sun, and water are good for them - they can sometimes exist in places you wouldn’t expect. Think about it - how many times have you seen a tree growing out of somewhere it doesn't look like it should be. No one bothered to tell the tree that. As for deer - that’ll be a big topic for the next newsletter, which will be the last one before the sale is over on January 9th. So - if you haven’t been convinced by all these great reasons not to buy nut trees - go ahead and buy some! Oh yeah - and we also have listed all our other new items for Spring 2017 - so you can have a peak at those, and pre-order those as well. They are eligible for the sale to get you up to $1000. Check out our new items here.